Esoterica is a paper circuit. I picked up a PC board based on it and got it working. But information about this circuit seems scant, beyond the paper graphic. Much of the circuit is familiar P.B. design territory, but I have a question about the balanced input represented by a castle symbol. I speculate that this might be connection for a piezo. And indeed when I connect a piezo disk there, it does impact the pitch of the sound. I made a video with sound of the board that I will post soon. More external information would be great, if you know or have any. in any event, interested to hear your findings ! Cool stuff, Richard, thank you for sharing! Much of the circuit is familiar P.B. design territory, but I have a question about the balanced input represented by a castle symbol. I speculate that this might be connection for a piezo. And indeed when I connect a piezo disk there, it does impact the pitch of the sound. I made a video with sound of the board that I will post soon. More external information would be great, if you know or have any. The castle symbol goes to two 220K resistors to transistor bases. It is definitely an input. I'm still looking at the details of this circuit and will post a schematic and some more information soon. Updated post with added block diagram and schematic. The Delay pot was having no effect, so I substituted a 470K for a 1M resistor on its wiper and now it does have effect. I also played with the CHAO resistor value and made it 220K instead of the 10K the original builder used. I didn't know what to use for X and Y, so I left those at 10K. 22K might work here, too. I just got sent an Esoterica PCB but there are a lot of component symbols on there that i just don't understand. Is there a site that has a general legend for component symbols ? *what the diodes are ? *what the symbols that look like chubby 4 stripe resistors are ? *what the symbols that look like they have a 'H" in the middle ? *what the '+ and -' transistors are ? *is that a zero ohm resistor between 'pitch' and 'chaos' pot pads ? *what the all the 'obscure' symbols represent. There was an master legend in the Yahoo Group, but incomplete. I can send it, if you want. Sometimes the symbols differ between the different circuits, I build only most of the rollz-5 and ended up buying PCBs from Meng Qi or the machines from Peter. What is good for both. If you could pass on that Master legend it would be a big help ! I finished my Esoterica yesterday and have begun testing it. I was just wondering if anyone could help me figure out why the output is so quiet ? BP : around 100mV which gradually works itself down to 0V over time. If i apply a lot of gain i can hear that the chaos pot is causing change and there is change when the 'antenna' and 'hairy spot' touch points are touched. The RES pot seems to have no effect , neither does the Decay pot the PITCH pot does have some effect at times, hard to tell when though. At the moment the pots and 'nana jack are just floating free as it isn't in an enclosure yet. One other thing is : is the electrolytic cap polarity definitely 'NEG' on the small circle ? I found that you have to touch the Delay node input to get much output. 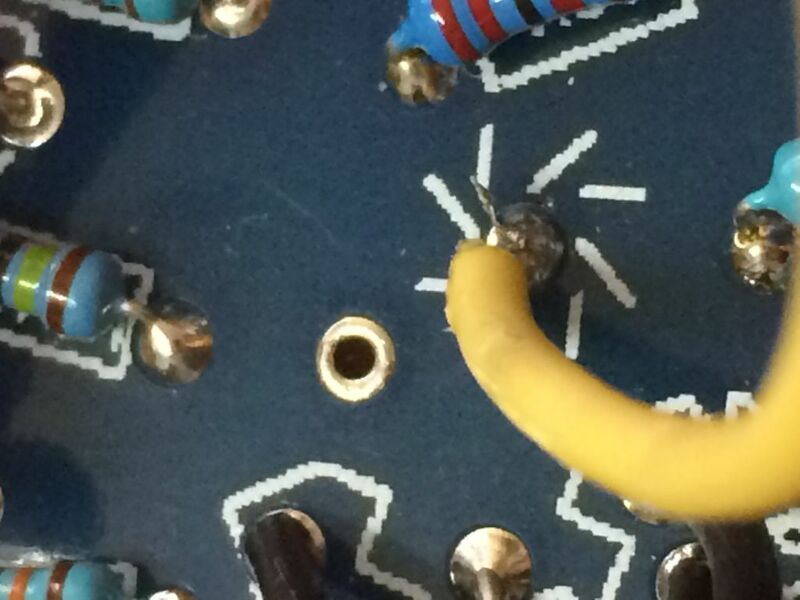 I also changed the 1M resistor going to the Delay pot to 470K, because otherwise the pot did nothing. Yes , i know what you mean about the Delay node and i already did that resistor change but the amount of gain i have to add is pretty insane to get a reasonable output. I'm wondering if there might be something wrong in some part of my build thats effecting the output gain ? LM13700 is reading +8.3V DC on the pos pin and 0V on the neg pin. TL074 is reading +8.3V DC on the pos pin and 0V on the neg pin. Power adapter is inputing +9.05V DC. also is there supposed to be a cap across the chaos node or is it just a touch point ? If it's only a touch point, what is the pad next to it for ? That doesn't look like the board I have. It's one Dennis sent me.